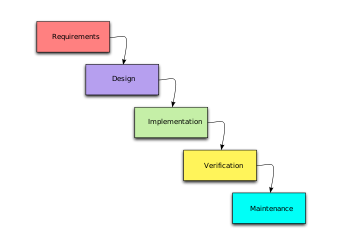 In a Waterfall process, each step must be completed before moving on to the next, and all steps in the process must be completed before any value is delivered to the customer. You can see from the illustration exactly where the name “waterfall” comes from–the development process literally “flows” from one stage to the next. Winston W. Royce first presented what is now known as the traditional Waterfall method in a 1970 paper, Managing the Development of Large Software Systems, at an IEEE event called WestCom. He didn’t use the term Waterfall, but he did describe a sequential process where each phase is completed before the next is begun. Royce went on to say that of course one would never want to run a software project this way—but somehow, the description of what would come to be known as Waterfall was taken out of context and widely adopted, to the extent that it is now considered standard operating procedure for large software projects. This entry was posted in w. Bookmark the permalink. Agile has moved to the DOD. This dictionary is very useful in oru DOD/DARPA work but rags in activities no longer in use. Thanks for the comment. We’ve chosen to use a diagram that is most similar to figure 2 in Royce’s paper, as that is the diagram that is most commonly associated with waterfall. As you point out, Royce was actually using that diagram as a bit of a straw man and goes on to diagram a more iterative process with feedback loops.